The M18 FORCE LOGIC Press Tool is the smallest, most intelligent press tool on the market. This state of the art technology enables 20% more run time per charge, 10% faster cycle timeand the single longest calibration interval in the industry at 50,000 cycles, all while being significantly smaller and over 20% lighter than the leading competitor. Like all Milwaukee Press Tools, the exclusive in-line design with a forward hand position unlocks the ability to press with one hand and will fit anywhere the user can fit their arm. The M18 FORCE LOGIC Press tool provides the highest level of press accuracy and reliability available in the industry. A prepress battery check ensures the tool won't start a press it can't complete, giving peace of mind in quality connections. Compatible with over 13 unique fitting systemsand 1/2 inch to 4 inch capacity, the M18 FORCE LOGIC Press Tool is a comprehensive press solution for plumbers and mechanical contractors. The BR200 is a Video Borescope Inspection Camera with 17 mm camera diameter and 3.5 inch colour TFT LCD Monitor which is ideal for Home Inspection (Inspect in walls for meld, insect infestation, electrical wire or water pipe location); HVAC ( Inspect inside ducts, behind motors and compressors); Automotive (View inside or around engines and transmissions); Industrial (Inspect weld integrity, process equipment, gears, moulding machines); Aerospace (Aircraft inspections for contamination, debris, cracks or other damage), and Government (Safety and security inspections) Applications. Glare-free close-up field of view. Detachable wireless colour display can be viewed from a remote location up to 32 feet from measurement point. Complete with 4 x AA batteries, microSD memory card with SD adapter, USB cable, extension tools (mirror, hook, magnet), video cable, AC Adapter (100-240V, 50/60Hz), magnetic base stand, and hard case. 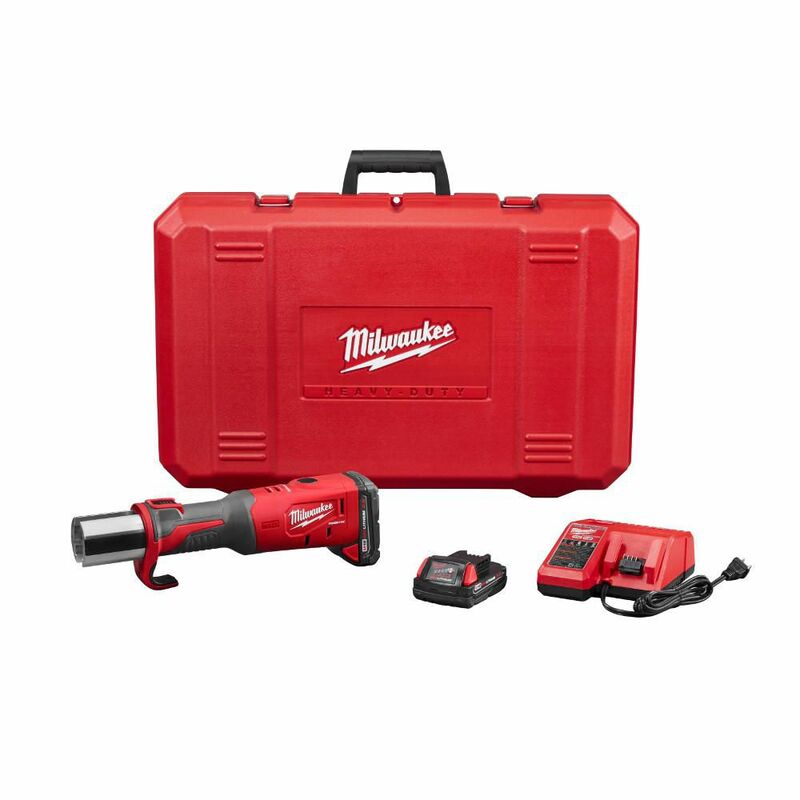 M18 18-Volt Lithium-Ion Brushless Cordless FORCE LOGIC Press W/(2) 2.0Ah Batteries and Hard Case The M18 FORCE LOGIC Press Tool is the smallest, most intelligent press tool on the market. This state of the art technology enables 20% more run time per charge, 10% faster cycle timeand the single longest calibration interval in the industry at 50,000 cycles, all while being significantly smaller and over 20% lighter than the leading competitor. Like all Milwaukee Press Tools, the exclusive in-line design with a forward hand position unlocks the ability to press with one hand and will fit anywhere the user can fit their arm. The M18 FORCE LOGIC Press tool provides the highest level of press accuracy and reliability available in the industry. A prepress battery check ensures the tool won't start a press it can't complete, giving peace of mind in quality connections. Compatible with over 13 unique fitting systemsand 1/2 inch to 4 inch capacity, the M18 FORCE LOGIC Press Tool is a comprehensive press solution for plumbers and mechanical contractors. M18 18-Volt Lithium-Ion Brushless Cordless FORCE LOGIC Press W/(2) 2.0Ah Batteries and Hard Case is rated 5.0 out of 5 by 4. Rated 5 out of 5 by Lenco from Albert Einstein would be jealous. This device is amazing better... Albert Einstein would be jealous. This device is amazing better than the rigid, do to the fact that this device can do both has and water fitting without buying two different devices. Who ever designed this machine just saved my shoulders from hand threading over the last 30 yrs.